I made more progress on panel #12 yesterday than I thought I would. I have 2/3 of the hard part done or what I think is the hard part. I'll know that for sure when I finish the other 1/3. I also finished Part 4 of "Human Action" last night and will be reading Part 6 by the end of today. I can see the possibility of finishing this book soon. As I said on 11 October it is 908 pages in paperback and 17,380 locations in Kindle. Not the longest book that I have read but it certainly ranks at the top. I do have Man, Economy and State with Power And Market by Murray N. Rothbard at 1,438 pages in paperback or 26,794 locations in Kindle loaded up and still to be read. I have also downloaded Democracy: The God That Failed by Hans-Hermann Hoppe which is a mere pamphlet in comparison. He claims Von Mises and Rothbard as his mentors so I need to read "Man" before reading his book. It may take me until almost 2017 to get all of that reading done. I need some time to draw! 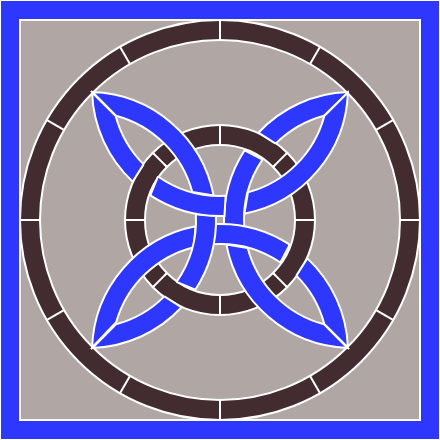 This is #13 and the sixth tile [36; 3342; 32.4.3.4] in the 3-uniform series with hexagons as the focus. 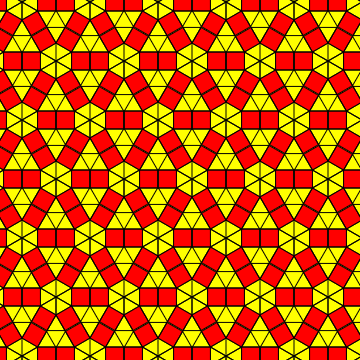 This also completes the first 1/3 of the thirty nine 3-uniform tilings with 3 vertex types. In the next 2/3 most of them have hexagons as the primary shape. Gold and silver went on a tear yesterday as the Dow Index took a fall. The Dow was not down a lot but the metals advanced a bunch; can not say the same for my portfolio but it always trails the movement in the metals. We will see what happens. I walked to the donut shop again this morning and when about a 1/4 mile before arriving I could feel some sprinkles. Thought I might get wet before I got back to Desperado but had only a few sprinkles on the way. It was a warm 58° so I had on my windbreaker rather than wool shirt/jacket. The weather guesser think there is a 30% chance rain today (which came about an hour after I reached shelter) but that increases to 80% tomorrow and 90% on Friday and Saturday. My walks may get interrupted during the next few days. Yes! I did finish Panel #12 yesterday. It is not an exact replication of what is shown but is very close and I think it looks good. I can not say that drawing Knots has become easy but each one that I do teaches me something. I drew this one differently than those that I did earlier from the previous web page and think it might have been easier but it was not as complex a Knot. There are more on the web page that I am now using for pattern ideas so I'll get a lot more practice. I got my new shoes yesterday morning. Delivered at about the same time of day by UPS as they did my shirts. This time I was sitting by the window and saw them dive up. These were Asics Men's Gel-Tech Walker Neo 4 Walking Shoes which replaced Saucony Men's Grid Omni Walking Shoes that I bought 18 March 2016 and had only 884 miles on them. I had some Asics once before, did not make a note about the model but know that I got over 1,000 miles out of them. We will see how well these wear and if they help my sore feet. I did a 2 mile walk in the afternoon and the shoes/feet felt better. Still some foot soreness to be expected but I think it was less. Then last night and this morning while in bed my feet still hurt. This morning's walk felt not much better but I best not give up too soon - I'll give the shoes a week before I say they are not going to make much difference. The rain forecast chances have now been reduced to only 50% today then 60% tomorrow and 80% on Saturday. That means my chances of staying dry while out walking have improved somewhat. The high temperature will drop a lot from the 87° that is was on Tuesday to maybe 64 today and 61 tomorrow and staying in the 60s for most of the time that I will still be here. My next camp will be about the same. I drew another tile yesterday but have not quite finished it. I'll get around to doing that today but have a lot of cooking to do. Then there is also "Human Action" that needs to be finished, I'm at 90% now so it is not going to be too much longer. Scott Adams, AKA Dilbert, has been posting almost daily blogs about the 2016 election and his take on what persuades people to vote one way or the other, The Persuasion Scorecard Update – One Week Out is his latest. I have quoted his summary paragraphs. Good stuff! In summary, Clinton’s message this closing week is that Trump is politically incorrect, offensive to many people, and sexually aggressive beyond the point of appropriate social behavior. That’s all the stuff you already assumed about Trump a year ago. And it doesn’t scare you, no matter how badly it offends you. Meanwhile, the current news cycle along with Trump’s supporters have framed Clinton as a low-stamina liar with a drinking problem who is running a criminal enterprise (The Clinton Foundation) that sells influence to foreign countries and companies that are more interested in war than peace. While she trash-talks Putin. That stuff could get all of us killed. Do you want proof that ANYTHING is possible? The Cubs won the World Series after 108 years! We got no rain yesterday and the weather gurus have reduced the chances for to today down to 20%. They have left their guess at 80% for tomorrow and have some chance of rain for almost every day in the 10 Day forecast. It only reached a high yesterday of 62 but expected to be in the mid-60s today and for the extended forecast. If it does not rain that will be fine. I started drawing panel #13 yesterday and got all the easy parts drawn. Then started in trying to draw a heart. Had no success on my own so went to the web and found the coding to draw one. It works but when I tried to flip it and make it smaller I created a mess. Went to bed and gave my mind a chance to think it over while I was asleep. I'll get back to it later today and see if that helped. This is #14 [324.12; 3.4.3.12; 3.122] in the 3-uniform series and the outlier, as I see it, among all the previous tile that had hexagons as the primary shapes. 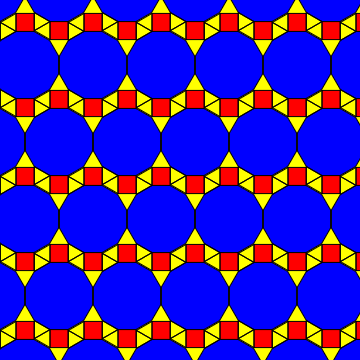 I misstated that it was a decagon, it and the previous tile had dodecagons. The above quote was taken from a blog posting Civil War II – Fourth Turning Intensifying (Part I) by Jim Quinn. I quote only one paragraph from the blog which I recommend reading. As an aside, I read The Fourth Turning sometime in late 1998 or 1999 and recommend it also. A vast swath of the populace has been lured into living beyond their means. The existing system is unsustainable. The Boomer generation does not want to yield on their perceived entitlements. The Millennial generation is saddled with un-payable debts, living in their parents’ basements, working the night shift at Ruby Tuesday. Generation X is trapped in the middle of this generational struggle. The huge economic imbalances, created by politicians buying votes and engineering wealth inequality to benefit the few, have built up over decades like flood waters behind a weakening levee. When the levee breaks the morally bankrupt criminal social order will be swept away in the raging torrent to follow. A last suggested reading assignment for today is The Office of the President of the United States by Raúl Ilargi Meijer. It is good! I finished it! If you want to go to the 'heart' of this book then read Part IV. That is not to say that the other parts of the book are not good but that is where he really gets into economics. A lot of the first thee Parts are devoted to his defense of the praxeology method for the study of economics. If you plan on reading other books by Von Mises then you can skip Part V, he repeats what he says in that Part in every book of his that I have read. The closing Parts of the book are well worth reading so don't give up too soon. I have one final passage that I highlighted from this book. Next up is the tome by Rothbard - I'm a glutton for punishment. But it is different in the field of social organization and economic policies. Here the best theories are useless if not supported by public opinion. They cannot work if not accepted by a majority of the people. Whatever the system of government may be, there cannot be any question of ruling a nation lastingly on the ground of doctrines at variance with public opinion. In the end the philosophy of the majority prevails. In the long run there cannot be any such thing as an unpopular system of government. The difference between democracy and despotism does not affect the final outcome. It refers only to the method by which the adjustment of the system of government to the ideology held by public opinion is brought about. Unpopular autocrats can only be dethroned by revolutionary upheavals, while unpopular democratic rulers are peacefully ousted in the next election. The supremacy of public opinion determines not only the singular role that economics occupies in the complex of thought and knowledge. It determines the whole process of human history. A busy day that started off fine but I got wet before my walk was finished. Stopped to fill up with gas on my way to the Farmers Country Market - North, and got wet again at both places. I had an unusual shopping list this week. I buy almost the same things every week but today I had upholstery cleaner, 9v battery, and Demarest shampoo on the list which required some store exploring. From there I continued north on Main St/US285, which is the wrong way for me to go home but there was a reason. I wanted to have breakfast at the High Chaparral Café where I got their Western Omelet. This is a decent breakfast stop but much too far for me to drive unless I need something from Tractor Supply. I thought it was south of Tractor Supply but by the time I got to Tractor I did not see that I had past it. My error, going north the restaurant is past Tractor. So I stopped at Tractor Supply first where I got the final piece of my wardrobe that needed replacing - C.E. Schmidt Men's Canvas Utility Jeans. I found these for the first time a year ago and like them so much better than 'blue jeans'. They are a more relaxed fit with bigger pockets that are easier to get into plus there are two small pockets on the right leg that are great for holding ammo and/or my GPS watch. To get back home I went south on US285 to Pine Lodge Rd. then turned south on US70 Bypass then Brasher and home; avoiding 'downtown' Roswell which is not all that bad. On my way north near the junction of US380 at Main the street was blocked off so I was glad that I had already selected this alternative to get back to the Park. Last but not least I dumped holding tanks and added fresh water when I got back to my space. I also got wet! As I get ready to post this the total rain so far is 0.58" with it looking like it could continue all day. I was able to stay dry during my afternoon walk yesterday. There was more rain but it came around 7:00 pm which did not add much. The total for the day was 0.69" setting a new record for 5 November that had held since 1953. This is not the first time I have been present for a new weather record; there was 15 May 2011 in Burns, OR; record heat 5 July 2007 in Klamath Falls, OR and during July 2002 and May 2003 in Reno, NV. There were probably others but I didn't write about them. With the time change I was out doing my morning walk at 5:00. When I got back to Desperado and fired up my laptop I saw the time on it and remembered that last night was when the clocks here were to 'fall back'. My laptop is the only time keeping device that I have that does that automatically. The next easiest to change is my wristwatch. I then have a GPS watch that is not too hard to change, a blood pressure monitor that is only slightly complicated and then my Paperwhite Kindel which seems straight forward enough but I had a hell of a time getting it to accept my finger taps/presses. I now have everything changed and they are within a minute or so of each other and whatever the 'correct' time might be. I have finished one of the panel #13 that I'm drawing. The second one on the same Canvas has been started and there is a good chance that I finish it today and have something to show tomorrow. Once I have drawn a heart the size I want and oriented as I want it is not that difficult to draw anther one like it at a new location. It is the sizing and orienting that is complex because each heart requires 6 cubic Bézier curves. There is probably a simple way to resize and reorient but I have yet to discover what it is. For the past couple of weeks I have seen more and more articles that suggest the election on Tuesday is not going to result in a peaceful transfer of power. Viva la Revolución? by Jeff Thomas is just one of them. I have quoted two paragraphs that I found thought provoking since I do not believe the Establishment will allow The Donald to become the next United States president. He may win the election although the odds are against him if the vote rigging really works. But even so there is the Electoral College vote which is the one that is decisive - I don't think he can win there even if he wins the popular vote. In these recent articles the Civil War is almost always brought up as what could repeat. I have not read any of them that bring up the other serious revolution that we have had in United States history - that being the election of 1800. This was the first peaceful transfer of power from one 'party' to another but it did not go smoothly. From Wikipedia: Historian Joyce Appleby said the election was "one of the most acrimonious in the annals of American history". There was a tie vote in the Electoral College with the president being finally selected in the House of Representatives. In my opinion next Tuesday will be the start of another revolution. It may be what Jeff Thomas refers to as “soft” revolution or a violent overthrow; it may rhyme with 1800 or Civil War. I put the upholstery cleaner to work last night with the idea that the chair would dry during the night. It was a good idea but did not work as planned. The chair was still rather damp this morning. I think I will give it another cleaning treatment. It looks better than it did but I hope a second treatment will make it even better. I did finish the double panel #13, which I have been incorrectly identifying as #12. I went back and made the corrections where I had previously said it was #12 although it is only I that really care. This was an interesting pattern with hearts since I had never drawn any of them before. The posting today by James Howard Kunstler, The Fat Lady Has a Sore Throat expresses my thinking about the election tomorrow so well that it is scary. It is not what he says that is scary it is the fact that I agree with him; or he now agrees with me. HA. I quote only his opening, he rants on from there and it gets even better. A mighty nausea wells up across the land as the awful day cometh. Who will receive the black spot of fate on Tuesday? I wouldn’t want to be him or her on that dreadful day. The flagship of Modernity has lost its vaunted mojo and nobody knows what to do about it as the USS-USA pitches and yaws into the maelstrom. As you watch the election voting returns I want to remind you that the 'popular vote' is meaningless. It is the vote of the 'electors' in the Electoral College that count with 270 required for a presidential candidate to be declared president. There is something else for you keep in mind. ALL electors are NOT required to vote for the candidate that they have pledged they will vote for. In United States presidential elections, a faithless elector is a member of the United States Electoral College who does not vote for the presidential or vice-presidential candidate for whom they had pledged to vote. That is, they actually vote for another candidate, or fail to vote, or choose not to vote. A pledged elector can become a faithless elector only by breaking their pledge; unpledged electors have no pledge to break. Electors are typically chosen and nominated by a political party or the party's presidential nominee: they are usually party members with a reputation for high loyalty to the party and its chosen candidate. Thus, a faithless elector runs the risk of party censure and political retaliation from their party, as well as potential criminal penalties in some states. Candidates for elector are nominated by state political parties in the months prior to Election Day. I have underlined some very important parts of what Wikipedia has said in the above quote. It is probably safe to assume that there are a number of #NeverTrump electors that have been chosen by the Republican Party. It is also probably safe to assume that some of them will take their marching orders from the Republican Establishment and gladly become faithless electors. I predict that The Donald will win the 'popular vote' and not receive the required 270 votes in the Electoral College and there will be a record number of faithless electors. We may then see SHTF. 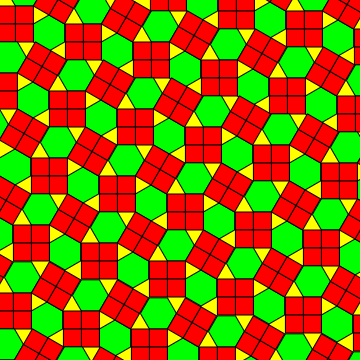 I will post this early and devote my time on Election Day to drawing the next tiling pattern. Vote early! Vote often! I did not stay up and watch the election returns come in. When I got to the donut shop this morning while on my walk I saw that The Donald was president elect but did not see an Electoral College count. Then when I got back to Desperado and fired up my laptop I found five different results for the Electoral count. They all had The Donald winning but four of the five had him winning with numbers greater than the 270 needed but between 279 and 274. Those numbers can change by the time the 'electors' votes are counted. I have shown some important dates that may change the Electoral College vote tally that the Ministry of Propaganda is reporting. There are plenty of opportunities for the Establishment to make sure the electors vote the way that the Establishment wants. States must make final decisions in any controversies over the appointment of their electors . I think the Establishment could send this presidential election into the House of Representatives if they so desire. But, they may be just as pleased to have The Donald as president and bring the economy down upon his head. He will then join Hoover in history and the Democrat Party left-wing will have free rein for years. Then there is this article, Celebs who said they’d leave country if Trump won, by Melanie Zanona. There have been more people claim they are going to leave than the author has listed in her article but I was certainly glad to see that she did include Al Sharpton and I hope he is on his way out this morning. 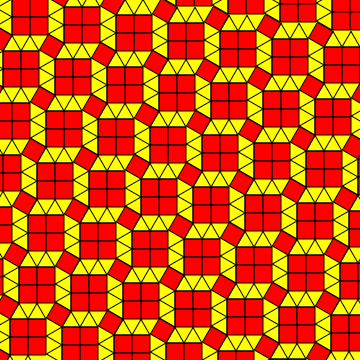 This is #15 [3.4.6.4; 3.426; 44] in the 3-uniform series which has hexagons but the more predominate shapes are squares formed from 4 adjoining squares. This tiling was a bit more difficult to draw than most of them in this series. I made 3-4 attempts before getting is right and the coding is probably not what it should be but it works. I like the looks of it a lot. I finished this yesterday and made a good start on Panel #14. When I say a good start I mean I made repeated starts and finally found one that was good. It was a challenging pattern that kept me occupied so not much "Man" book reading. I need to give the drawings a rest and read for a while today. A lot of homemaker stuff this morning. Did laundry again and got in that added mile of walking to and fro. Then as soon I finished eating breakfast I started cooking up another batch for my next 6-7 breakfasts at home. I also made up a pot of veg chili with pinto beans, crushed tomato, onion, powdered cayenne peppers and some Bakers chocolate. That will go over the top of fried potatoes & zucchini. I have almost finished panel #14. The drawing is done but I am still trying on different colors. I'll settle on something and have it posted tomorrow. My prediction of 8 November 2016: "I predict that The Donald will win the 'popular vote' and not receive the required 270 votes in the Electoral College and there will be a record number of faithless electors." I was 180° wrong, The Hill probably won the popular vote and The Donald won the Electoral college vote easily. By early afternoon yesterday The Donald was awarded the state of Michigan bringing his total Electoral College elector vote up to 295. Then I saw last night that all the votes were accounted for with The Donald at 310 and The Hill with 228. That is now a total for The Donald that would be very difficult for the Establishment to bring down below the 270 required for him to become president. However, that just gives me more reason to think that the economy is going to get hit, hit hard. The Donald is also going to get the same treatment from the Ministry of Propaganda as president that he did as a candidate. President Obama had the Ministry as a pet and they served him well. They will continue to serve the Democrat Party and former President Obama well who will probably get as much, or more, media coverage after he leaves office as President Trump does in office - certainly from a favorability point of view. The question that is nagging my mind now is will President Obama grant The Hill a pardon or won't he? I was almost certain that he would do so if she won the election and would become the next president. It would have created a political firestorm but no more so than her having an Attorney General (Lynch ?) that would not prosecute her. But now that she has lost what does Obama have to gain by granting her a pardon? I don't think he likes her, or Bill, so he just might throw her under the bus and not grant her one while running up a record for issuing them to other low lifers. In the article The Working Class Won The Election by Paul Craig Roberts also says a lot that I have been thinking. The entire article is good but what I have quoted may be at the heart of it. I also read a lighthearted article, Breaking News From Canada, from The Burning Platform. Take a minute, release some of your election news stress - read it. This was my last shopping day while here and I went to Farmers Country Market - North again because last week I was able to get Greek Gods Honey. I have my bottle of vanilla so I wanted to get the Honey again. But, they had none. They did have a few containers of different flavors of Greek Gods by no Honey or Honey Vanilla so I got some Oikos. They were also sold out of the Prairie Dairy large curd cottage cheese that I have liked so well. They also had one of the smallest selections of toothpaste that I have ever seen in a large market, I have seen larger selections in convenience stores. I am disappointed with Farmers Country Market. They have three locations here in Roswell and dominate the market so I guess they can get away with offering what they want OR their customer base does not have the same requirements that I do. It has been a long time since I had breakfast at a Denny's and I passed one every time I went to the North store so that is where I ate this morning. Went with my favorite, the Santa Fe Skillet, which has always been good. The place was packed and everyone was talking at once and it sounded like we were in a big bucket - the noise level was terrible. I'll be working on my 3x5 route card this afternoon. The route is not very complex but I do need to select a possible breakfast stop. I will also be looking for a grocery market for next week and hope I make a better selection. I do like all of the markets that are part of the Kroger group and have also usually had good luck with local stores. Just a part of the good life as lived on the road! 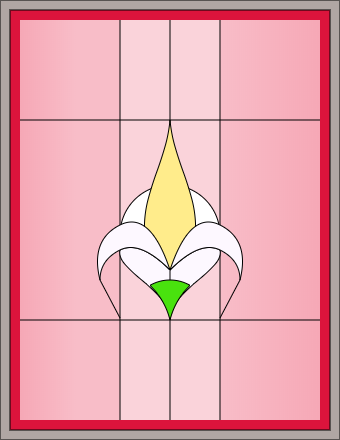 This is Panel #14 or what I have come to think of as a Fleur-de-lis. I usually draw the patterns as line drawings then fill with color. This time I did not try to do the line drawing first and relied on layering with the fill colors to hide/mask any extra/missing lines. This drawing also required a lot of Bézier curves but not as many as the previous one with the hearts. The unbearable smugness of the press by Will Rahn is a profession suicide note. Everything that the says is true but he is going to be shunned by his peers and possibly fired from his CBS News Digital position. Do read what he has to say, he gets it! The Anti-Trump Protesters Are Tools of the Oligarchy by Paul Craig Roberts is a good article about the "progressive's" protest. He too believes that The Donald will be assassinated if he goes forward and tries to implement the policies that he promised he would. The fog burned off by 8:00 yesterday but it never did get very warm. It was only 51° at about 10:30 and I felt cold so the Wave 6 went to work for a little bit to take the chill out of Desperado. No fog this morning but it is going to be the same kind of day with the high expected to be 61°. The low this morning was 44° and at 8:00 it was still at that same temperature so the Wave 6 was brought out once more. Today will be house cleaning time. I got the bathroom done and washed down the bathroom and kitchen floor this morning. Maybe get the living room and cab area vacuumed after posting this. Cab dash and windows will keep until tomorrow. I am watching the price of gold and silver go down, down, down since the election is over and it seems that the consensus is that the two metals are now worthless. I read that the bond market has also plunged which means that rates have spiked upward. The 'experts' claim this is because The Donald will cause inflation to rise. I'm soooo confused. Increasing interest rates anticipating greater inflation and precious metals going down in price? I thought it was the other way around? Leftist Fascism Unleashed by Dr. Michael J. Hurd is an article that the Ministry of Propaganda will not be reporting. In it he says "They claim that people who voted for Trump should, at a minimum, be shamed, punished or even killed." That is just way, way outside the Ministry's narrative. I have quoted his closing. Donald Trump’s election may have unleashed some hatred on the world. But I don’t see the hatred coming from his supporters. I never heard Trump supporters wanting to kill or shame people who thought the opposite. I heard strong opinions coming from them, but not death threats. The real fascism emanating from people are the leftists who lost. It’s called liberal fascism, and it’s not a pretty thing to watch. Why A Politically Correct West Ensures A Trump Victory by Chris MacIntosh on July 29, 2016 said the following; why has it been so difficult for any of the 'experts' to see it coming? A lot colder this morning with the low at 37° and 39 while I was out walking. I finished doing all my house cleaning chores this morning. I also decided to fill the fresh water tank and to dump holding tank. I was going to do it tomorrow morning after unhooking from electric but before leaving but I don't want to be out there doing it in the cold. A couple days ago I noticed a tire that looks like it is low although not completely flat yet. I'll go to Big O Tire here in Roswell tomorrow morning after I leave the Park and before heading for my next camp. There is a tire repair shop nearby on one of my walking routes but I have Big O tires and they will fix a flat for free (I think). It is worth the slight out of my way to find out. I finished the first four chapters of Man, Economy, and State with Power and Market last night or some 6,000 locations of the 27,000. Man, Economy, and State is 12 chapters and about 17,000 locations then Power and Market make up the rest of the book. What I can say so far is that it covers the same ground that "Human Action" did but does so with easier to read language and better examples. That does not mean it is easy reading but it is easier. If I were to recommend one book over the other I know already it would be - read "Man". A Tale of Two Cities by Uncola is the second in a three part series. The first two parts have been very good. I have selected only one paragraph but recommend they be read. Furthermore, the narrative of racism in America is now being screamed through the media bullhorns calling for unity against the whitelash, as protests funded by the globalist, George Soros, are being staged all across the nation. If Hillary won and Trump supporters took to the streets like this the media would be reporting it as anarchy, racism, and third-world, banana republic tactics by ignorant and deplorable, sore losing neanderthals. The media has come to represent all that is wrong with America today. They call for unity yet create only division. They are the problem because they are on the wrong side of history. They have forsaken morality and the American way. What’s Causing Post-Election Hysteria? by Dr. Michael J. Hurd is his blog posting on what is causing the snowflake meltdown. I think he has got it exactly right when he says that government has become a religion for many people in the United States and he is not writing about the Tea Party. It’s interesting to note we did not see this kind of hysteria after Obama was elected. People who didn’t want Obama elected president in 2008 and 2012 were every bit as unhappy as Hillary voters are today, believe me! We sucked it up and consoled ourselves in the knowledge that government is not everything, and if we end up having to oppose or fight the government to sustain our lives, so be it. But progressives are the ones who look to government as kind of a secular, urban religion to reassure them that the universe is a reasonable, benevolent and intelligent place. They need government for that. You see, that’s the whole problem with progressivism, as with every form of socialism and collectivism human beings have ever devised. The answer is not out there. It’s within ourselves, not in the group or the government. It always has been, and it always will be. The only government that helps us is the one guaranteed to protect and preserve our sovereignty over our lives, our individual rights, our property rights and, at least implicitly, our individualism. Government should not be a religion. Yet to millions of people, it is. And right now, that’s much of the basis for all the hysteria, hurt, anger, rage and helplessness you see. I did not have far to travel today but extended it a little by going to Big O Tire before leaving Roswell. The tire was flat for the same reason that I had one go flat in Loa, UT on 3 June 2014; the valve stem was broken an leaking. I arrived at Big O a few minutes before 7:00 expecting to wait until 7:30 but one of employees showed up at 7:00 and went to work on fixing it. I was on the road by 7:45 at no charge for the fix. Stopped at Chaos Café for breakfast where I had their Migas. I have never seen this on a menu before so had to try it. It is something like chilaquiles, which I do not care for, but much more like Huevos a la Mexicana which I do like. It was good and the side of whole beans was excellent. Coffee was fair and the price was very reasonable, I'll be going back once more before I leave here. Was backed into my space here by 10:00 because of the short 68 mile drive. I have described the route as I drove it which included the detour to Big O: Brasher Rd, Main St, College Blvd, US70 Bypass/Relief Route/ US285, County 31/Lakewood Rd (shown as NM381 on Google Maps) & SKP Ranch Rd (County 31A). I am in a space on the north side of the park facing the southeast with some trees and storage buildings on that side that provide shade and privacy. Not that the privacy is needed that much. Compared to my space in Roswell there could be two rigs parked where I am now. There are some large pines trees on the west side but a couple spaces from me so I don't know how much shade that might provide. Very nice space! It was about 40° this morning while on my walk. That is one of the Park negatives - not many different walking route opportunities. The other negative is there are no showers so I need to use my very small one in Desperado. The morning lows will be down near freezing during this weekend then warming back up into the 40s if I can believe the forecast. Yesterday afternoon when I returned from my walk I remembered that there was a woman that lived here that had commented on RvSueandcrew's blog. Saw the woman that had checked me in at the office coming out of the Club House and asked about her. Received directions to the woman's space and stopped for a visit on the way back to Desperado. I'm not a big socializer so did not have much interest in going to the Park's Happy Hour. But, she plays music at them so I will go to at least one to hear her play. One of her fellow musicians was a Peace Corps volunteer so I may meet him and exchange some Returned PCV lies tales. 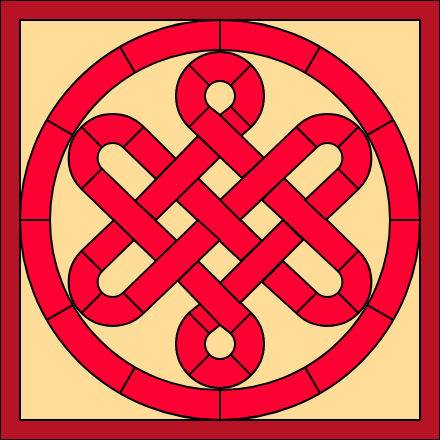 This is #16 [32.4.3.4; 3.4.6.4; 3.426] in the 3-uniform series which has hexagons as the more predominate shapes. 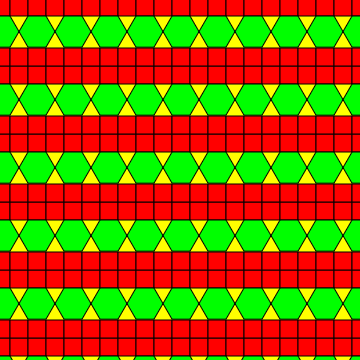 This tiling was very easy to draw which made up for the difficulty of the previous one in this series. I'm am currently drawing a pair of panel #15s which I think are going to look very nice. I have also discovered some coding technique in doing the tilings that I am carrying over when drawing this pair of panels. Good learning process! Both of my afternoon walks have been attempts to circumnavigate the RV Park. There is a road that goes about 3/4 the way around but then there is a wash to cross and after that grass, brush, cactus and NASTY grass burrs. Sharp devils that are worse than goat heads. I will keep trying. Yesterday I found a cow path that was a great route until I lost it amongst the grass burrs. This morning I walked County 31 west toward US285 until I found a gate and traces of a road going out into the field that I want to walk through. Can not get through the gate nor the fence but I may still try to reach that overgrown road this afternoon through the field. If I can then maybe I can also find a cow path that will lead me back to SKP Road (County 31A). As I said yesterday there are not a lot of route choices available. This is my drawing of two Panel #15s on one Canvas. It was much easier to draw than I thought it would be. I drew the arch using quadratic Bezier curves but now that they are done I have learned how to draw them using circles which is much easier. 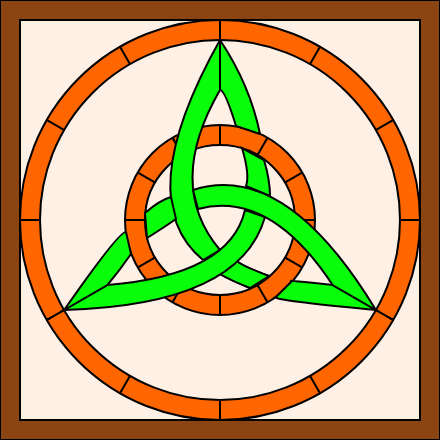 The quatrefoil rosettes where easily done with coding for only one of them and then using 'For Loops' to draw the others using that same coding. 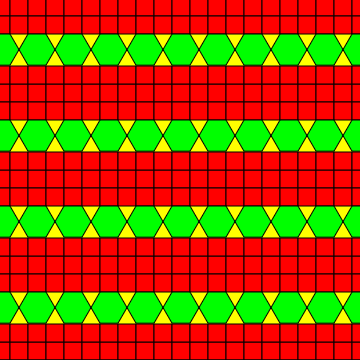 This is somewhat the same thing that I have been doing when coding the tiling drawings. This morning was my first shopping trip from this new location. There is not much distance difference between going to Artisia or to Carlsbad but I had an on-line order waiting for me at Tractor Supply in Carlsbad. There was breakfast to be had first at Pecos River where I got their scrambled eggs with hot green chile. I was told it was HOT and for once I found it to match what I consider hot. It was good, the service was good, they open early for the oil field workers and the place was packed. The noise level was terrible plus I got to pay more than what I consider a good price, I probably will not go back. Picked up my order at Tractor Supply and then went to La Tienda Thriftway for a new grocery shopping adventure. I think Carlsbad is also a west West Texas town as was Artesia from what I saw of it as I drove through. They are both oil patch towns with a lot of traffic for relatively small towns. The grocery shopping experience in Roswell was repeated here. I think the markets this far east, on the western edge of what I consider Two Bread Country, do not stock some of the items that I consider staples because no one here eats them. I'll make do the best that I can but sure miss my Greek Gods yogurt and my 86% dark chocolate. I will say that the market today did have better produce than I was able to get in Roswell. It was warmer this morning with almost a solid cloud cover. By the time I was leaving for the Park the wind had come up and blew them all away. It was trying to blow everything else away also. Strong side winds against Desperado all they way back and then buffeted us after I got backed into my space. The Wind Advisory started at 9:00am with expected winds of 30mph and gusts of 50. A cold front is blowing in with the forecast high tomorrow to be only 58° and Saturday at 55. The low temperatures are expected to be at or below freezing so my basement heater gets plugged in again tomorrow. The New American Communist Revolution? by Martin Armstrong is a short blog posting that says what others are also starting to say. An American Red Guard(? ), something I think President Obama wanted many years ago, is on the march. Bought and paid for by the same people that were supporting The Hill. There is an attempt to create a socialist revolution in this country led by the youth and Obama and Hillary seem happy with that... The Democrats seems to be intent on burning down democracy if they do not win. I have never seen this get so out of hand in my lifetime. There is a lot of evidence surfacing showing that these protesters are being paid by organizations alleged to be funded by George Soros, which is why Hillary remains silent. Adds recruiting these people are appearing on Craig’s List around the country. Obama, Clinton, And Sanders Could Stop The Riots But They Just Watch by Daisy Luther is a blog posting that says what the Ministry of Propaganda will not. I have quote her closing paragraph. Oh – and one quick note. It has to be said. The people calling for war and death are overwhelmingly anti-gun. They just might want to rethink the wisdom of directing their death threats, physical attacks, and aggression toward Second Amendment proponents. Colder this morning at the expected 36° and probably a little lower. The SKP Park underground weather station is not reporting this morning so I'm guessing at how cold it was. As planned I plugged in my basement heater in anticipation of a 30° low Saturday morning and a 31 on Sunday morning. If the actual low temperature is lower than forecast, which it usually is, then I may need the heater although the guessers don't think it will stay below freezing for very long. We will see. I am making good progress drawing Panel #16. What I have learned is paying off. It has been easier to draw and I'm making it look more symmetrical which is what a Knot is intended to be. The others that I have drawn were close but never quite right, this one is looking 'right'. I may finish it today or tomorrow and have it posted this weekend. This is #17 [3342; 324.3.4; 44] in the 3-uniform series which again uses squares formed from 4 adjoining squares as the predominate shapes. 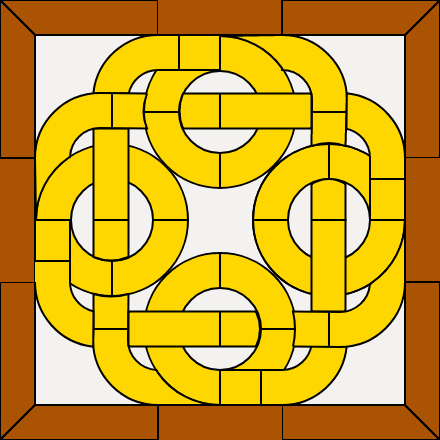 The tile block for this pattern was easy to draw but getting the positioning right for the tiling was the hardest part to do. Trump Can Make Land of Opportunity Great Again by Dr. Michael Hurd is another of his articles that makes so much sense that that chances that what he proses will happen are very small. I have selected a couple paragraphs to give you a 'flavor' of what he has to say. To blow the wheels off the gravy train, we have to blow up the idea that any person is entitled to the wealth and prosperity of another. That ingrained notion will be much harder to fight than anything Donald Trump encountered in his presidential campaign. The SKP underground weather station finally reported the yesterday low at 33°. They then quit reporting again this morning around 4:30 when the temperature was 27°. I am guessing that it was about 24-25 out there when I went for my walk. Yesterday I had my wool shirt/jacket on with a flannel shirt and was a little cold. This morning I wore my French Voyager wool capote and was very comfortable. I'll probably need it again tomorrow morning but then starting Monday morning it is forecast to be back into the lower 40s or upper 30s. I have now finished the first seven chapters of Man, Economy, and State with Power and Market which the author claims to be volume I of "Man" although the table of content does not show it that way. Chapters 8 through 12 will be volume II and then "Power and Market" make up the rest of the book. The language and better examples continued but I was totally lost in Chapter 7. Starting with Chapter 8 he will be moving away from economic theory and more into the real economy; so he says and so I hope. I think he lost me in Chapter 7 because I could not associate what he was writing with any real world experience. I continue to recommend "Man" versus "Human Action" for the simpler language although it is not easy reading. I also have Democracy: The God That Failed by Hans-Hermann Hoppe on my Paperwhite and read the introduction a couple weeks ago. Started on Chapter 1, "On Time Preference, Government, and the Process of Decivilization", yesterday and found that he is covering the same time preference ground that Von Mises did. He has stated that Murray Rothbard was his "principal teacher, mentor and master". So it is good that I have read "Human Action" and well on my way through "Man" before starting "Democracy". I am virtually finished with Panel #16 just trying to find a color scheme that I like. I have also started another tiling that drawing the tile was a piece of cake. 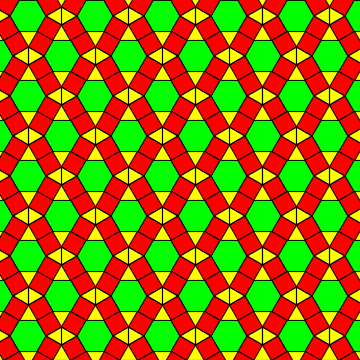 Now the challenge is to get the individual tiles to create a pattern. Just started Panel #17 which is another Knot but looks like it may be easier - I'll know soon. The last two afternoons I have gone along the fence line and then turned north into the field to check out a couple of site that are visible on Google Maps. The first one to the east looks like it might have been an old homestead then later when electricity became available a well with an electric pump. The site on the west side looked like a foundation on the Map but turned out to be stock ponds. They are now dry and have been for many years with the well casing about all that remains that says what it once was. Probably a windmill at one time but that is long gone. It was warmer this morning, maybe just below freezing. No more freezing mornings in the forecast until late in the month. I checked my basement heater yesterday and it was working fine. I'll leave it hooked up until I go shopping again. It will probably come on every morning when it drops below 35° but should not really be needed if the forecast is correct and it doesn't freeze. 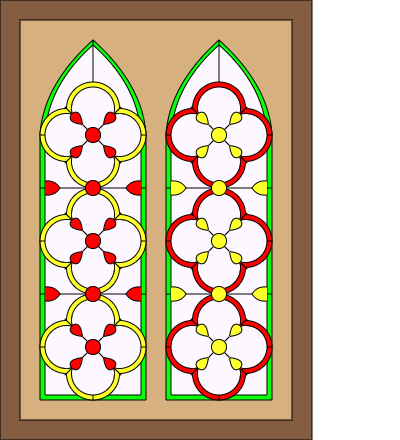 Panel #16 is done which I was able to draw using circles rather than Bézier curves. This resulted in a more uniform or symmetrical Knot than what I have been able to draw in the past. I knew this but never could determine what the radius needed to be nor where to place the circle center. For this drawing I was able to do that. For Knots in the future I think I may now know how but only when I try again will I know for sure. For those readers that have not heard or read the President's and The Hill's statements about the anti-Trump protests I am quoting them to prove that they have spoken to the issue. There have been critics that claim that the have not done so. Surely these well spoken words will quell the paid for mobs. I think Soros is throwing good money after bad by buying these protests. He is 'on the wrong side of history' as our soon to be former president Obama is wont to say. Trump is only a symbol of the 'change' that was spoken of so much in 2008; he and it have now arrived. Grey Champion Assumes Command (Part One) by James Quinn makes this point by selecting the quote I have included below. I follow that by quoting the closing to this Part I and look forward to the next part. Grey Champions are not universally adored or defended. They aggravated societal pressures that had been ignored or deferred by their predecessors. Compromise was not an alternative for these men. They were going to lead in a confrontational style suited to the times, using unyielding principles to vanquish their enemies. Grey Champions have a particular set of personality traits making them well suited to lead during a Crisis. They have the facility to overlook the complexities of life and focus on one simple imperative: society must prevail. In Part Two of this article I will assess the prospects of success for our new Grey Champion – Donald J. Trump and why this Fourth Turning is about to turn nasty. Not as cold but it stayed rather cold all morning. Then the clouds moved in and has kept it that way. There is a slight chance of rain in the forecast but they do not look like rain clouds to me. I am well on my way with drawing Panel #17 - Knot #3. My new found knowledge seems to be paying off since I have been able to use circles to give me nice even spaced curved corners. I knew that was what I needed to be using but the radius and where to place the circle center had been escaping me. Maybe finish it in another day or two. I started another tiling to give me a break from the Knot. That was perhaps a mistake, it took me 4 tries before I got the tile block drawn correctly. The good thing was that when I did get it right then the blocks fit together easily to create the pattern. Those two drawings, twice daily walks and the reading of 2-3 books and articles/blogs is what makes up most of my days. That is certainly all that I'm doing today. Grey Champion Assumes Command (Part Two) is not an article for the faint of heart - it is grim. But unfortunately most of what James Quinn has written will likely come to pass. I quote the opening which is a quote from The Donald and the closing which is again from The Fourth Turning. It got cold fast last night so I expected it to be colder than the forecast this morning. Went out with my wool capote on and found that it was a wise choice. We did get a little rain yesterday but the official SKP weather underground station did not even record it as a trace. So my guess that it would not rain held up - sort of. This is #18 & #19 [3.426; 3.6.3.6; 44], they both have this same number idintifying them and look the same, in the 3-uniform series. I started #20 in the series and see that #21 is the same also. When I finish it I'll only be showing the one. I have almost finished Panel #17 - Knot #3 and it is looking good. I read more of "Democracy" last night and have some highlighted passages that I be posting tomorrow. I am more sure now than when I first downloaded it that it is a 'bootleg' copy. The footnotes and main text are rather jumbled together much like what I have got when I have tried to convert a .pdf file. It is readable but NOT a very good e-book. Another shopping day and another shopping adventure in a new market. This morning I went to Artesia where I stopped at Chaos Café and had their Huevos con Chorizo. It was good and I think I'll stick with them for a breakfast stop in Artesia. Then it was on to Fenn's Country Market where I found no Greek Gods and no Oikos on the shelf where there should have been some. I asked about the Oikos and if there was anymore Prairie Dairy large curd cottage cheese, I had found only one remaining container. There was a pallet of dairy that had not been stocked and I helped unloaded about a third of it until I had both of those missing items. Backed into my space at the Park and lined up to dump holding tanks plus take on fresh water. Then pulled forward to where I like to be while 'at home'. The space here is very big so I have plenty of choices. I did not connect my basement heater with the forecast at above freezing through Saturday. I will be going into Carlsbad again that day and will plug in the heater when I return with most of the mornings next week at or below freezing and the daily high temperatures in the mid-50s to mid-60s. I think I'll be seeing some winter here before I leave. Democracy: The God That Failed by Hans-Hermann Hoppe has LOTS of footnotes with many of them attritubing his thoughts to "Human Action" and "Man". His writing is more libertarian than Rothbard who wrote with a more libertarian slant than did Von Mises. Hoppe also frequently cites Bertrand de Jouvenel des Ursins (Bertrand de Jouvenel), so there is another author that I need to explore. I have selected a long passage from "Democracy" for the posting today and then an even longer one tomorrow. As will be explained in the course of the following section, if government property-rights violations take their course and grow extensive enough, the natural tendency of humanity to build an expanding stock of capital and durable consumer goods and to become increasingly more farsighted and provide for ever-more distant goals may not only come to a standstill, but may be reversed by a tendency toward decivilization: formerly provident providers will be turned into drunks or daydreamers, adults into children, civilized men into barbarians, and producers into criminals. The government does not, indeed, waylay a man in a lonely place, spring upon him from the roadside, and holding a pistol to his head, proceed to rifle his pockets. But the robbery is none the less a robbery on that account; and it is far more dastardly and shameful. The highwayman takes solely upon himself the responsibility, danger, and crime of his own act. He does not pretend that he has a rightful claim to your money, or that he intends to use it for your own benefit. He does not pretend to be anything but a robber. He has not acquired impudence enough to profess to be merely a "protector," and that he takes men's money against their will, merely to enable him to "protect" those infatuated travelers, who feel perfectly able to protect themselves, or do not appreciate his peculiar system of protection. He is too sensible a man to make such professions as these. Furthermore, having taken your money, he leaves you, as you wish him to do. He does not persist in following you on the road, against your will; assuming to be your rightful "sovereign," on account of the "protection" he affords you. He does not keep "protecting" you, by commanding you to bow down and serve him; by requiring you to do this, and forbidding you to do that; by robbing you out of more money as often as he finds it for his interest or pleasure to do so; and by branding you as a rebel, a traitor, and an enemy to your country, and shooting you down without mercy, if you dispute his authority, or resist his demands. He is too much of a gentleman to be guilty of such impostures, and insults, and villainies as these. In short, he does not, in addition to robbing you, attempt to make you either his dupe or his slave. I'll be celebrating Thanksgiving in my usual fashion by treating it like any other day. There will be a little less News reading with perhaps more "Man" reading and some more drawing to be done on panel #18 - Knot #4. I have finished Panel #17 - Knot #3 and was so encouraged that I tackled the next one straight away. I'll post the completed one tomorrow, I'm applying color to it today. This is the another selection from "Democracy", complete with footnotes, that I found to be very good. Hans-Hermann Hoppe seems to be describing what the United States has become over the past 80 years or so. 29 Until the end of the nineteenth century, the bulk of public spending—often more than 50 percent—typically went to financing the army (which, assuming government expenditures to be 5 percent of national product, amounted to military expenditures of 2.5 percent of national product). The rest went to government administration. Welfare spending or "public charity" played almost no role. In contrast, under democratic republicanism military expenditures have typically risen to 5-10 percent of national product. But with public expenditures making up 50 percent of national product, military expenditures now only represent 10 to 20 percent of total government spending. The bulk of public spending, typically more than 50 percent of total expenditures—and 25 percent of the national product—now is eaten up by public-welfare spending. 30 Most important among the policies affecting social time preference is the introduction of "social security" legislation, as it was introduced during the 1880s in Bismarck's Germany and then became universal throughout the Western world in the aftermath of World War I. By relieving an individual of the task of having to provide for his own old age, the range and the temporal horizon of private provisionary action will be reduced. In particular, the value of marriage, family, and children will fall because they are less needed if one can fall back on "public" assistance. Indeed, since the onset of the democratic-republican age, all indicators of "family dysfunction" have exhibited a systematic upward tendency: the number of children has declined, the size of the endogenous population has stagnated or even fallen, and the rates of divorce, illegitimacy, single parenting, singledom, and abortion have risen. Moreover, personal-savings rates have begun to stagnate or even decline rather than rise proportionally or even over-proportionally with rising incomes. Will the Swamp Swallow Trump? by Bill Bonner is an article that asks the question that many are now asking. In the article he writes about his conversation with David Stockman and it is what Stockman said that I quote. Stockman believes the swamp will swallow up Mr. Trump, his army, and his big budget plans. “I’ve seen it happen. There are alligators in that swamp,” says David, showing his scars. Each gator will fight for his own subsidy, his spending, his budget, his tax break, his job, his power, his agency, his pet project. There will be splashing around… tails swinging wildly… body parts chewed off… and blood in the water up and down the Potomac. Republicans will want cuts to social programs if they are going to approve more spending on infrastructure and the military. Democrats will refuse to go along with Trump’s spending unless social programs are preserved. Every step the new president takes will bring him deeper into the swamp. I needed more Arbuckles and thought yesterday would be a good time to place the order. They can fill it today and boost the total sales for Black Friday and make it look like President Obama's Recovery has really taken hold. They put up a new web site some time between my order from Taos and my order while at Roswell. When I ordered from Roswell I had to re-register my password. Yesterday that password did not work so I went through the process of creating my account again. After doing so it brought up my prior order history but did not show Roswell. I think(?) I now have an order placed and maybe will receive some more coffee. The good news - they reduced the price by over 10%. It did dip down below freezing this morning but did it after I finished my walk. Then stayed below 32° for only about 1/2 hour and started moving back up again - slowly. I will plug by basement heater in again tomorrow afternoon. Starting next Tuesday through the end of the 10 Day forecast the low will be in the 20s. Winter has caught me! I don't understand what is going on with my data usage but it is strange. In the last few days I have had two mornings when I received a notice from NetWorx that I had used my self imposed daily quota by 8-9:00. Usually I have only used about 1/2 of that by the time I read through the News and my Daily blogs. Fortunately the WIFI here is pretty good and I can stay connected to the Internet but I would like to know what is happening. Finished Chapter 1 of "Democracy" which was 20% of the total Paperwhite locations. Also reached 50% in "Man" which is at Chapter 11. When I downloaded "Man" it included "Power and Market: Government and the Economy" making for a very long book which were originally published separately. I am going to separate them and review "Man" when I finish it then pause before reading "Power". I need to finish "Bullets" that I have on Adobe Reader in .pdf format as well as "Democracy" on Paperwhite. Then I'll go back to "Power". I also have bookmarked a 7 part "Theory of Interest and Prices in Paper Currency" by Keith Weiner that I have just started - I'll read them off and on when I need a break from reading other 'stuff' on-line. I will not claim that I now know how to draw Knots but I do believe I'm getting better at doing it. This one used circles again and IF I can get the radius right plus find the correct x,y coordinate then the curves look very good. Getting the over and under weave is still a time consuming process but I think I have done this one well. The Donald has been posited as being a non-politician which is true if you accept the definition as being someone that is active in party politics. If you think of him as someone that is experienced in the art or science of administration then his skills become more apparent even in the field of politics. This quote from From Bullets To Ballots The Election of 1800 and the First Peaceful Transfer of Political Power by John Zvesper may explain the 'new' Trump as president elect. If truth is not a necessary casualty of party warfare, it is (as Winston Churchill remarked when speaking of war pure and simple) sufficiently precious that sometimes it must be surrounded by a bodyguard of lies. One of the common features of partisan politics is that certain things come to be talked about with profitable imprecision, and this is no less true with parties of principle. Opinions are misrepresented for partisan advantage. Powerful but partial slogans and sound bites are coined. Similarities are denied. Distinctions are blurred...To Jefferson, misrepresentation was a fair partisan tactic. There have been a lot of members of the Ministry of Propaganda as well as the alt-News pontificate on why The Donald won. I think Fred Reed has done as good a job as any in his blog posting Uniquely Talented: Only the Democrats Could Have Lost to Trump. I liked this passage well enough to quote it but the entire posting is good. The privileged denigrated all whites unlike themselves. Then Hillary made her “deplorables” speech, confirming her contempt for half of America–those uneducated, shapeless, dull-witted proles in Flyover Land, obese, farting and belching, swilling Bud, watching NASCAR for god’s sake in awful trailers. And why not sneer at them? Why did Hillary need their votes? Did not Rachel Maddow love her? After I finished my morning walk I unhooked from electric and went to Carlsbad. There I stopped at Junior's Burritos & Mexican Restaurant and had their Huevos ala Mexicana. It was good enough that I will go back but higher priced than what the appearance of the place would suggest. After breakfast I went to the Shooting Range & Action Sports Recreation Area that adjoins the Living Desert State Park. I was meeting up with the Cavern City Action Shooters that I had contacted a month or two ago and asked if I could join them during their scheduled shoot. I shot my usual fair at those targets that were about 15' and closer. Shot my very poor at those that were more distant than that. This was the first time that I have shot five 'stages' that were set up for a match. There were some good shooters there and almost everyone was trying to score well to raise their match classification. There were about 13-16 people shooting and 5 stages so that meant a lot of standing which I can not do anymore. After a couple hours I was looking for places where I could sit for a while. That also makes this posting much later in the day than usual but I am going to get it done. By This Measure, the U.S. has the 2nd Highest National Debt by Jeff Desjardins was posted over a year ago therefor it is somewhat worse now. What the Debt to Central Government Revenue visualization shows is that 'taxing the rich' is not going to fix the US Debt problem. If ALL tax receipts from ALL taxpayers at current rates were applied to debt repayment it would take 10 years to pay it all. During that 10 years there would be NO federal spending for anything not even interest on the declining debt balance. Seriously - Huston, we have a problem! Low cloud cover this morning that kept it warmer than yesterday but the weather guessers have issued a Wind Advisory for this afternoon. They usually get the wind right so 50mph gusts may be shaking Desperado before the day is done. The forecast continues to have freezing and below lows starting next Tuesday and are now showing a 70% chance of snow next Saturday. This is #20 & #21 [3.426; 3.6.3.6; 44], they both have this same number identifying them and look the same, in the 3-uniform series. I have made good progress on Panel #18 - Knot #4 with my new found skills in using circles. Now have the basic line drawing done that allows for color fills and only need to add decorative lines and choice colors. It is a good Knot! I'll be working on that drawing and reading. Maybe finish " From Bullets To Ballots" today and devote some more time to "Theory of Interest and Prices in Paper Currency". I am reading about that now in Chapter 11 of "Man" but he is writing with the gold standard being still in place. That is not what the real world has been using for a monetary system since 1971 so it is hard to relate to the experiences of today. Today will be more of the same except I need to get started on next months Will Rogers weekly articles. It was not very cold this morning but the winds are still with us. That will change starting tomorrow with the 10 Day forecast showing high temperatures in the 50s and lows in the upper 20s and low 30s. The weather guessers have removed their chance of snow on Saturday but the expected high is 47°. It will not be a good day for man nor beast! It seems that Black Friday has been expanded to include Thanksgiving as well as the weekend following. However you define it this 2016 shopping extravaganza has been declared in the red versus the black. Gallup is reporting that $752, on average, will be spent on holiday purchases this year down from $830 planed for in 2015. That means the average 'consumer' is expected to spend $752 that they don't have, for 'stuff' they don't need to give to people they don't really like. What a country! The Democratic Party has long claimed Thomas Jefferson as the founder of their party. But in recent years they have severed those ties; he has been cast aside in the name of 'social justice'. In my opinion they should never have claimed him as a founder. Modern historians claim that Jefferson along with Madison was the founder of the Democratic-Republican Party but they called themselves the Republican Party. If there was a founder of the Democratic Party it was Alexander Hamilton and his Federalist Party, he is more the 'model' of a Progressive Democrat. Born out of wedlock in the British West Indies, a central bank founder, a strong national government supporter, a war hawk and admitted to an adulterous affair. If you have any interest in American history I suggest reading "From Bullets To Ballots The Election of 1800 and the First Peaceful Transfer of Political Power by John Zvesper. It is another case where history does not repeat but it does rhyme. There is a lot of similarity between the period 1790 - 1800 to 2008 - 2016 with perhaps more rhyming to come. Welcome to Hooverville by Jeff Thomas presents a scenario that may be that rhyme. There are other writers that have said that The Donald was 'allowed' to win so he can be the fall guy in the coming collapse. I doubt that but do believe that this article is prescience. Yesterday I got the Will Rogers weekly articles copied and formatted for another month. Finished reading "From Bullets To Ballots", read Part III of "Theory of Interest and Prices in Paper Currency" and am now into Chapter 12, the last one, of "Man". I won't make that kind of progress on my reading list today. It was a shopping day. But first I went to the Pecos River Café again for breakfast and had their Western Omelet. Very expensive and not very good. I have given them two chances and will not grant a third. Then it was on to La Tienda Thriftway to get groceries for the week. That did not complete all my chores in Carlsbad this day. There was also a dental office I needed to find so I can go to my appointment next Monday. Plus I needed to do laundry. It was easier to do it in town than to mess with all the 'rules' for using the SKP Park laundry. Plus, the one at the Park was a long walk from my space. When I say it was easier that started after I found someplace to do it. My first choice seemed to be a coin laundry per a Google Search but I found that not to be true. The clerk there provided me with directions to a coin laundry but she was 180° out of phase. Told me to turn left, should have been right, then said it would be on my left but it was on my right. Found it and laundry is done. A little expensive to wash but was able to dry for $0.75 so not too bad. I recommend the Carlsbad Laundry on Church St. 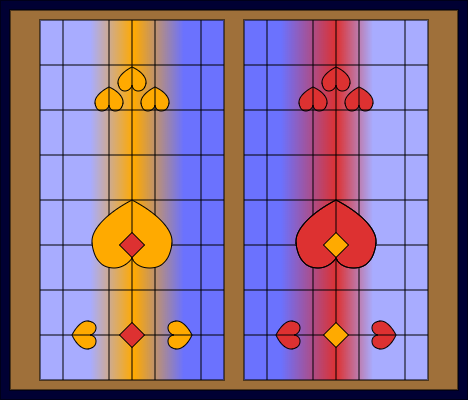 This is Panel #18 - Knot #4 with one more Knot, and a quasi-knot, shown on the first page of panels at http://www.free-stainedglass.com/index.php. I think I did well with this one. Now the next one is presenting a new challenge which may require some added time - but I'm gearing up. Yesterday I wrote about the rhyme of history and how The Donald may be the next Hoover. He is getting a lot of grief from all sides about his Secretary of State choice. This is what Will Rogers had to say about Hoover and his Secretary appointment. Hoover went down into Democratic territory, but that dident stop the Boys from flocking in. You can’t hardly go so far that an office seeker can’t find you. As I pen these lines it looks like my friend Morrow dident want the Secretary of State job.1 He feels I know that he is not through in Mexico yet, and that he would rather get that done right, than take a chance on a job that nobody knows what would likely happen to you. That’s a tough Baby that Secretary of State thing. You come in there labeled as a Statesman and limp out headed for the ash Can of Political hopes. The temperature dropped down into the 40s soon after the sun went down yesterday and was into the 30s by the time I went to bed. Fired up the Wave 6 which is something I would not usually do; usually I would just get in bed. But, I was making great progress in drawing Knot #5 and did not want to stop. I found some help with the coding on-line which has made it possible for me to do the drawing 'right'. This morning I knew it was cold while out walking because my legs were cold. It needs to get quite a bit below freezing before I can feel it in my legs. That is what it was; 20-21° while I was out there. It didn't get above freezing until a little after 8:00 although there was a clear sky and plenty of sunshine. Still only 43° as I post this and the Wave 6 is continuing to do its thing. The weather gurus have raised their forecast for the low from the 20s for the next few days but now think there is a 70% chance of rain on Saturday with an expected high of 44°. I don't believe the lows will be out of the 20s but can hope for a 27-29° range. There appears to be no hope for Saturday. All Aboard! Trump’s Express Train to the Future by Bill Bonner is a blog posting that reinforces what I just finished reading in "Man". This is what Rothbard had to say about government "investing". Secondly, we have seen that if government itself does the “investing” out of the confiscated savings of others, the result, for many reasons, is not genuine investment, but waste assets. The capital built out of coerced savings, then, instead of benefiting the consumers, is largely wasted and dissipated. Even if government uses the money to subsidize various private investments, the results are still grave; for these investments, being uneconomic in relation to genuine consumers’ demand and profit-and-loss signals on the market, will constitute malinvestment. Once the government removed its subsidies and let all capital compete equally in serving consumers, it is doubtful how much of this investment would survive. ...“capital” is not just a homogeneous blob that can be added to or subtracted from. Capital is an intricate, delicate, interweaving structure of capital goods. All of the delicate strands of this structure have to fit, and fit precisely, or else malinvestment occurs. The free market is almost an automatic mechanism for such fitting; and we have seen throughout this volume how the free market, with its price system and profit-and-loss criteria, adjusts the output and variety of the different strands of production, preventing any one from getting long out of alignment. But under socialism or with massive government investment, there is no such mechanism for fitting and harmonizing. Deprived of a free price system and profit and-loss criteria, the government can only blunder along, blindly “investing” without being able to invest properly in the right fields, the right products, or the right places. This is one of my disappointments in The Donald. He is proposing to do a Trillion $ Stimulus like the shovel ready Obama Stimulus. But, it has been suggested that this time the feds should invest in the businesses of 10,000 of the 'most promising entrepreneurs of the future' forming public-private partnerships. Even IF he does not fund what are now known as 'crony capitalist' I can not see this being a good idea. As Bonner says "We can’t imagine a group of hacks, has-beens, and bureaucratic chair warmers capable of identifying the 'industries of the future.' No one else has been able to foresee the future. How could they?"